The following is CV Magazine’s interview with REPROCELL Europe’s CSO Professor Stefan Przyborski. REPROCELL Europe specialises in the development of innovative technologies to build human tissues from cultured cells for the benefit of research and discovery and ultimately therapeutic applications. We invited the man behind their 3D culture technology, Chief Scientific Officer Professor Stefan Przyborski, to provide an in depth overview of the firm and its service offering. Stefan Przyborski is the Professor of Cell Technology at Durham University and is an expert on cell differentiation and the formation of tissue structure and function. To overcome the limitations of conventional cell culture methods, he researched and developed technology to enable three dimensional (3D) growth of cultured mammalian cells in the laboratory. He founded Reinnervate Limited as a spin out company from Durham University in 2002 as a vehicle to develop and commercialise this technology. Conventional cell culture methods primarily enable the growth of cells as flat two dimensional mono layers. This severely restricts the ability to recreate the appropriate structure and function of cells and can potentially influence the outcome of the data produced. Alvetex technology was developed to enable scientists to recreate the more natural 3D cell structure of cells in a robust and routine manner, and to produce human tissue-like in vitro models that more accurately reflect the structure and function of their native counterparts. The data generated from the study of such 3D models is of significant value enabling scientists to more precisely simulate the cellular and molecular processes in real tissues and enhance the predictive accuracy of drug action. Professor Przyborski developed the Alvetex series of products based on underpinning research at Durham University. Alvetex is a porous polystyrene membrane that enables cultured cells to retain their natural 3D architecture and prevent cells from flattening as in conventional cell culture. The maintenance of the natural 3D shape of cells is essential for normal function and the spatial arrangement of different cell types as found in real tissues. A primary focus and application of Alvetex technology is the construction of more sophisticated and complex tissue models including layers of multiple cell types. Essentially such technology is being used to recreate the natural anatomy and structure of human tissues for use in the research laboratory. These human tissue models will dramatically impact the ability to: advance the research and drug discovery process; improve efficiency and reduce research costs overall; and reduce and replace the need to use animals in research. ReproCELL Europe specialises in the development of innovative technologies to build human tissues from cultured cells for the benefit of research and discovery and ultimately therapeutic applications. We invited the man behind their 3D culture technology, Chief Scientific Officer Professor Stefan Przyborski, to provide an in depth overview of the firm and its service offering. Alvetex is sold to cell biologists and researchers using cell culture methods in academic, government, and industry laboratories. This is a global market opportunity relevant to any scientist using mammalian cell culture. Alvetex is firmly embedded in the product portfolio offered by ReproCELL that also includes stem cell technology, specialised media and reagents, and contract research services. Stefan talks us through the technology in more detail. Alvetex is sold to cell biologists and researchers using cell culture methods in academic, government, and industry laboratories. This is a global market opportunity relevant to any scientist using mammalian cell culture. We have invested heavily in demonstrating the application and use of our products in multiple areas of cell culture, including cancer, liver, neuroscience, skin biology, stem cell science, and general tissue development. Several flagship applications of Alvetex technology have been achieved as the technology becomes recognised and established in the scientific community. 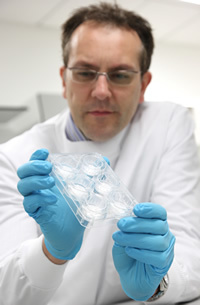 For example, Alvetex underpins the construction of a skin tissue model heavily sponsored by a major corporate company. Alvetex has also made its way onto the International Space Station and is part of a major research programme to investigate the effect of zero gravity conditions on the formation of bone in space. “Our customers have purchased and applied Alvetex technology to advance their research in many ways. Already within its relatively short period of product life, there are now well over fifty peer reviewed independent scientific publications resulting from our customer base, reporting a diverse range of applications for Alvetex technology. As a consequence of this intense activity, there is a significant growth in 3D cell culture using scaffold-based technologies. Our sales are increasing alongside this growth in the sector” Stefan adds. There are now well over fifty peer reviewed independent scientific publications resulting from our customer base, reporting a diverse range of applications for Alvetex technology. Ultimately, the Technology Innovator Award reflects the many years of work and significant investment dedicated to the development and application of 3D cell culture technology. The more recent application of such products to the development of advanced in vitro models of human tissues opens up new opportunities for the development of bespoke assays and contract research service offering. It has always been the ambition of the inventor of Alvetex, Professor Stefan Przyborski, to change the way researchers perform cell culture and offer new more advanced solutions to studying cells and tissues in the laboratory. Alvetex is an example of a game changing technology driven from the beginning by Professor Przyborski and his research at Durham University and the subsequent commercialisation of his invention by Reinnervate and now REPROCELL Europe.